117 Hudson: L'Shanah Tovah Etc. A hearty happy "head of the year" to you! National Park(ing) Day isn't a holiday but it is weird and cool. My favorite wine store is sponsoring a park(ing) space this year, too. Yay! 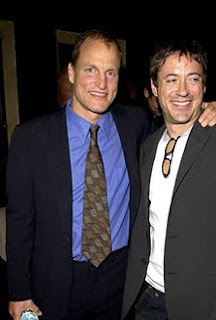 I would watch a reality show of Robert Downey, Jr. and Woody Harrelson sitting in a house and talking for hours on end. In fact I might not ever be able to stop watching it. Here are the first items on my Life List: 1. Travel to Italy with MamaKizz, Queen Bee & Zelda, 2. Go with Queen Bee to visit Ella Bee in China, 3. Have a gallery show of my photography. My ability to craft coherent essays has been compromised. I blame the onion rings. I could sit and watch RDJr have a conversation with a stump and completely love it.